Art credits to Emma Bertram! The 21st century so far has been a period of remarkable social growth and upheaval. The explosion of second-wave feminism and the worldwide spread of democracy changed the way we think, speak, and do. However, despite these two massive titans of social reform, the creation of the internet and the culture that it spawned has ripped the rug from under the status quo. The internet provides a cocoon of anonymity, allowing victims and dissenters to speak without fear of retribution. As such, the average individual now wields a near-infinite power: to disrupt, to reshape, to revolt. In the past two decades, the world has seen this power used to shut down corruption, to punish injustice, to destroy despotism. Anonymity, however, is not without its drawbacks. The cocoon also protects the user from the social consequences that would disincentivize those actions in tangible reality. This allows mob mentality to rule over cool-headed thinking. The Tide Pod “Challenge” is a great illustrator of anonymity and internet culture at work. It hijacked the fact that we all had this subconscious, untold belief that a Tide Pod would taste good. When we discovered that other people had this belief too, we laughed at the “relatability” of the meme. Eager to take part in this small, novel, human connection, we brought up the meme to friends, expanding its influence. The meme travels on its own power, spreading at the rate that it entertains its subjects. 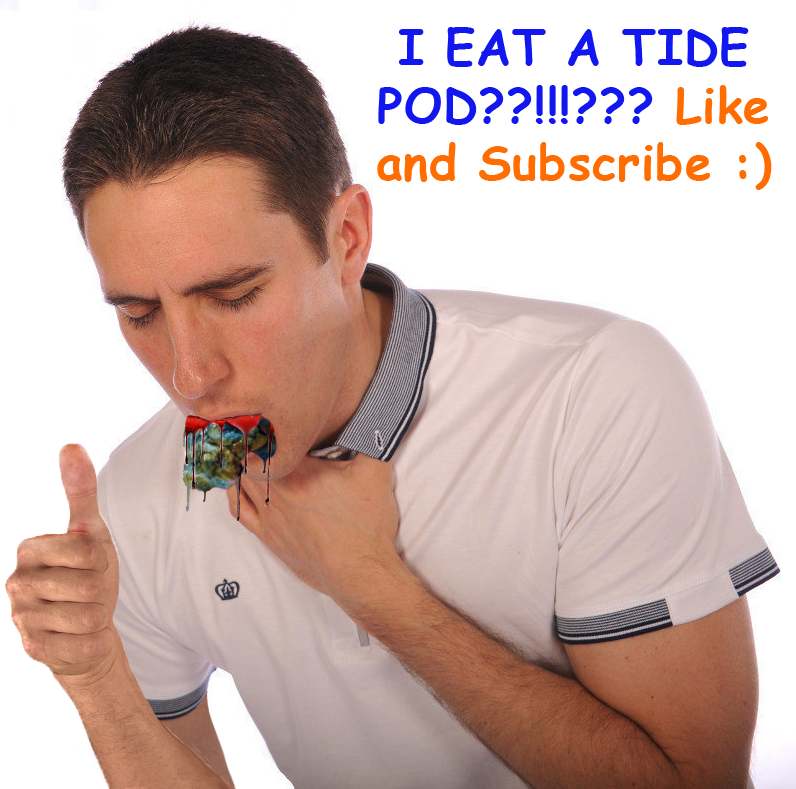 A Tide Pod meme consists of anything relating to the desire of eating Tide Pods. Among many participants in the meme, this means actually eating the Tide Pod. Needless to say, this is a terrible idea. A concentrated detergent, Tide Pods contain substances like polyvinyl alcohol and disodium distyrylbiphenyl disulfonate, dangerous chemicals with dangerous names. Eight children have already died upon eating Tide Pods since they came out in 2015, and 39 incidents of teenagers intentionally abusing the laundry pods and getting sick have occured in the same time span. The volume of teenagers posting videos of themselves attempting the challenge on video sharing platform Youtube, has prompted its parent company Alphabet Inc. (Alphabet is the parent company of Google, which owns YouTube) to crack down on these videos, saying that they violated community guideline number two: “Don’t post videos that encourage others to do things that might cause them to get badly hurt, especially kids”. Even the US government has gotten involved. The Consumer Product Safety Commision tweeted “A meme should not become a family tragedy” to discourage the challenge. For its part, Tide Pod manufacturer Proctor and Gamble released an advertisement in which they strongly condemned the consumption of their product. In Ridge High School, the Tide Pod meme did not gain much traction, with some students completely unaware of its existence. Others, like Adith Sundram ‘20 criticized the meme. He states “Eating a Tide Pod isn’t funny when you actually do it … it’s actually really dangerous”. Some were more lenient but still chiding. Arul Gupta ‘20 said that “I get that it’s a joke, but really going to eat the Tide Pod is just overkill”. It seems that the risk of death that comes attached to the frivolous “Challenge” is well known among our student body. For Tide Pods and all other figments of internet culture, the bottom line is that the meme should not carry over into reality. When a macabre joke becomes a macabre action, people will get hurt.